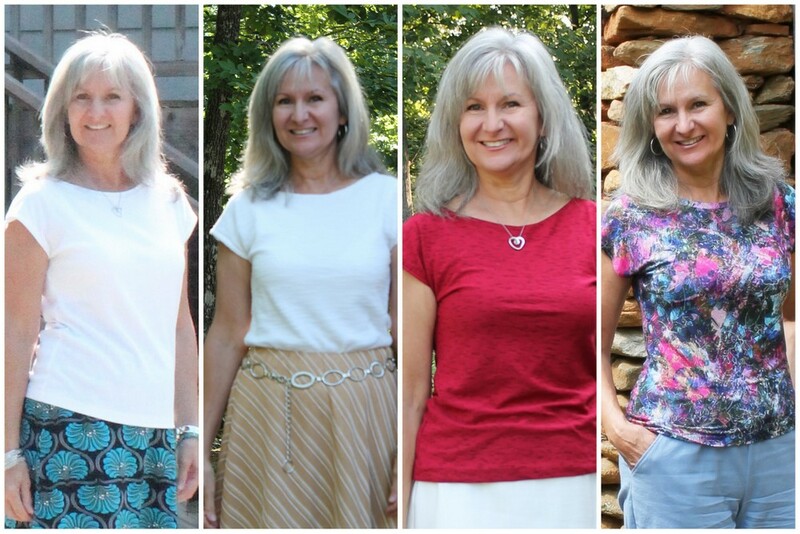 2014 was my first full year sewing my clothes and it has been a learning curve year that has brought skill building in many areas, a few frustrations, and much enjoyment. Participating in 'Make a Garment a Month Challenge' was good for me... to teach me to take the time to plan, as well as keep on track to sew for myself. It's easy for me to get distracted with home dec projects, projects for my girls, as well as quilts for ministries and family members. But sew for myself I did and made 20 garments, just for me! Even though I kept the 2014 Gallery up-to-date, it was still a surprise when the numbers were totaled. So let's see how that all worked out. You can find all the project links on the 2014 Gallery page and links in my sidebar. 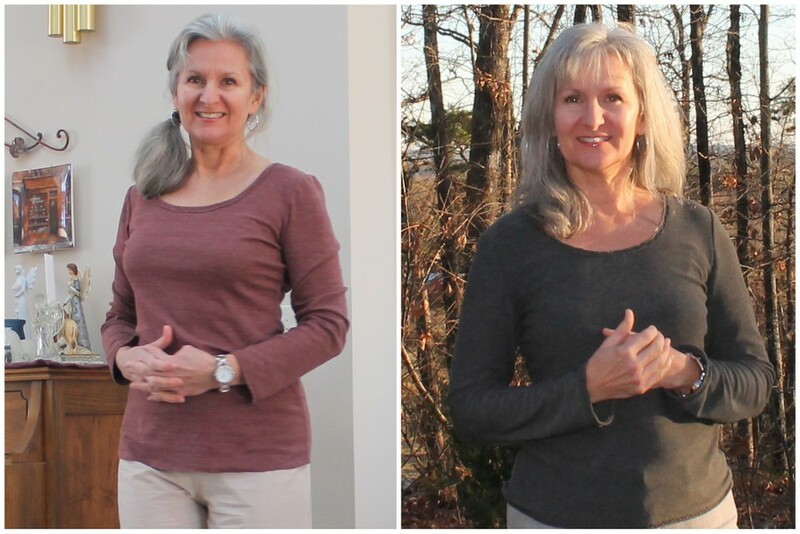 My favorite tops are definitely the 2 Alabama Chanin inspired tops. Discovered a love for hand-stitching and though I may be oh-so-slow, it is a process I really enjoy. Used NEWLOOK 6735 as the base shirt. Next up, the 4 - Kirsten Kimono Tees that were made. This is a free pattern from Maria Denmark that makes up quickly into a nice little shirt that goes well under jackets, or on its own. The Vogue 1247 Rachel Comey top and self-drafted, lined skirt were worn lots even though this top is a little big on me. When the reviews say a pattern runs big, it runs big and the size 10 swallows me..... but who cares! 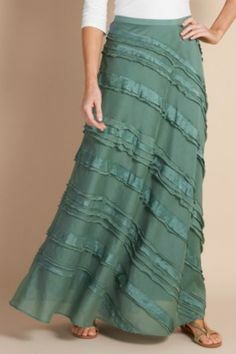 It is a great top out of soft, fluid moving fabric and the converging seams matched perfectly. Plan to make it again soon cutting a size 6 flaring to a 10 at the hem and taking out the big curve at the sides. Another creative process I enjoyed was copying a rtw inspiration skirt using NEWLOOK 6108 as a start. Let's see, the self-drafted floaty top has been fun to wear too. And I continue to love my poncho even more!!! Ponchos are fun to wear and this one was a fun creative process to make altering the McCall's M6209 pattern to delete the scarf attachment, used selvage edges for the finish, and a biggie...... add flannel lined pockets with a big button! Gotta' have pockets! The Shetland Lace Scarf, also in photo below, accessorizes the poncho perfectly. This was the first time to sew for my husband and will definitely do more for him in the future. 3 quilts were made this year with the biggest project to-date being the Road to Oklahoma quilt for my cousin Clifford. Participated in Lily Pad Quilting's annual 'Pets on Quilts Show' and my Bugs! a Baby Boy's Quilt won a gift certificate to Abbi May's online store. The fabric I ordered will be used to make a quilt for my family this year. Again participated in Gene Black's quilt ministry and donated a strip quilt to be given to a child in a children's home in my home state of Alabama. During the month of May it was all about Me-Made-May-2014. So new to garment sewing, this was the first year I could even consider participating, and even though I had many repeats, I am so glad I did. Ladies around the world, were so nice to this newcomer and so supportive and I learned SO much. Taking daily photographs forced me to focus on bettering my photography skills and it was a good chance to go different places to focus on the photography, as well as the garment. These are the highlights of this past year and am looking forward to 2015. A few of my plans are to continue to participate in 'Make a Garment a Month Challenge' and another Me-Made-May with hopes to have a few more garments made before then to offset so many repeats. This will be the year to make quilts for my home and immediate family members, so not sure if there will be time for another Alabama children's home quilt. Will have to see on that. Will try to time a quilt to be ready for Lily Pad Quilting's Pets on Quilts show as that was nice to meet other quilters and see their adorable pets. There are a few home dec projects waiting to be begun with the first being Roman Shades for our hearth room. Got the material and all the supplies just need to jump in. Never made roman shades before, so that will be another learning curve to tackle. My husband's 1947 CJ-2A jeep (it's a guy thing) needs new seat covers/cushions complete with fastening pockets on the back and again, all the supplies and materials are purchased just need to figure where to start with that one.... and hope my machine can handle sewing military weight canvas! And the biggie..... to continue the learning process of sewing my clothes, figuring out my 'style', what looks best on my body type and what works with my lifestyle. Impressive body of work! You have a very good sense of the colors and styles that suit you. You use such soft, pretty colors and everything is so nicely made! That's a very successful first year, for sure! Your generosity in sewing for others is evident...and much admired. Good luck with the car seat sewing. Be sure and invest in a lot of heavy weight needles! Thank you Judy! and hope that sweet little granddaughter of yours continues on the road to good health. You have made a lot of pretty garments, I am impressed! Thank you Hana! What a sweet compliment! and I look forward to seeing the wonderful garments you will be making this year too! You made quite a bit during the year - it's amazing how it all adds up. And all of your garments have a little something special about them. I agree, the AC tops are wonderful - you are now inspiring me to make on of these one day (the one day list is very long :)). Thank you Sarah Liz! Most of these garments were part of the Make a Garment a Month challenge, and again, thank you so much for spearheading such a wonderful, supportive group. You made so many pretty things! I enjoy reading your blog & seeing what you're up to. BTW, cute dog! Thank you Beverly! I enjoy reading yours too! You have had such a productive year with so many beautiful garments, quilts, and wonderful gifts. Looking forward to seeing what 2015 brings! Thank you Remembering Oz! You too!